"To the Triplett Family. I was made ware of Mr, Triplett's passing by the NFL's 2018 review of who has past away during the 2018 year from the NFL family. My condolences to your family. My prayer's, thoughts,wishes to your family. 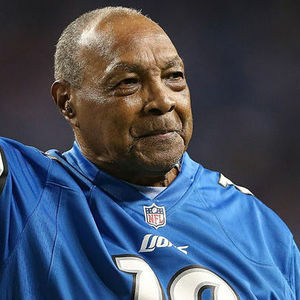 As your family reflects upon the memories of his journey, I to went back in time when I read he was on the '49 roster of the Detroit Lions. My father and Mr. Triplett crossed paths that season. Twice. Walked, played, sweated on the same turf under the common goal to play a game. Thank you for my vision of dad through the face and smile of Mr. Triplett. Respectfully, Tom Fritsch. son of Ted Fritsch '42-'50.Green Bay Packers." "Thank you to everyone who shared their condolences and words of comfort. Our family is truly grateful to you, and continue to hold tight to the legacy and love of our dear father and grandfather Wally Triplett."